Nick Martorano serves as a Project Manager at Centaur. Nick’s multi-faceted perspective of the industry result from experience in both architecture and project management. This experience is augmented by a sincere desire to complete projects on time and on budget. His projects include retail stores, custom residential, warehouses, office buildings and multi-family condominiums.As a Project Manager for Centaur, Nick is involved in all stages of the process from conceptualization to completion. He actively participates in the planning and formulation of design alternatives to managing budgets and schedule constraints. In addition, Nick oversees all aspects of day-to-day operations during construction. Here he ensures the projects meet our exact standards while complying with design specifications, including state and federal policies and regulations. Prior to joining Centaur, Nick worked as a Project Architect/Project Manager for a full-service development company specializing in multi-story residential condominium buildings. He gained valuable knowledge and experience studying the feasibility of properties for particular developments, working within the company’s architecture department to design and execute construction drawings, and engaging in project management through the in-house general contracting division. Nick began his career in 1998 as a Site Superintendent working on many commercial jobs from the Union Nissan Truck Dealerships and a 40,000 sq. ft. office/warehouse build-out to high-end retail. He utilized his Bachelor’s Degree in Architecture from the University of Illinois at Champaign-Urbana, worked for two architectural firms, and is also a licensed architect. His prior projects included the Brookfield Zoo Dolphinarium and Sleepy Hollow Resort. 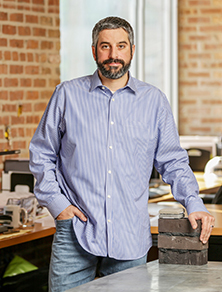 At Centaur, Nick’s projects include 2450 N. Lakeview, Chicago IL (Private Residence), 525 Broadsmore, Lake Forest IL (Private Residence), 1009 N. Rush, Chicago IL (Commercial/Retail), 930 N. Rush, Chicago IL (Commercial/Retail), 1627 N. Damen (Commercial/Retail), and 1727 N. Damen (Commercial/Retail). Nick enjoys watching and participating in several sports including football, basketball, softball, hockey, skiing and golfing. An avid outdoorsman, Nick likes to spend his down-time camping, hiking and fishing.